I needed a new server case due to Antec P180 case becoming much to cramped. After reading many positive forums posts about the Cooler Master Stacker cases, I made my purchase. Here are my thoughts. To be clear, this is the older Stacker 810 case, not the newer Stacker 830 Evolution. I think the 810 offers many for features for a much lower price; I’m not sure why the 830 is even around. My DVD drive was very easy to install in the case, just place a plastic guide rail on the side and slide it into the locking drive bay. The 4-in-3 drive bay (which fits four 3.5″ hard drives in three 5.25″ bays and includes a 120mm cooling fan) was not so easy. 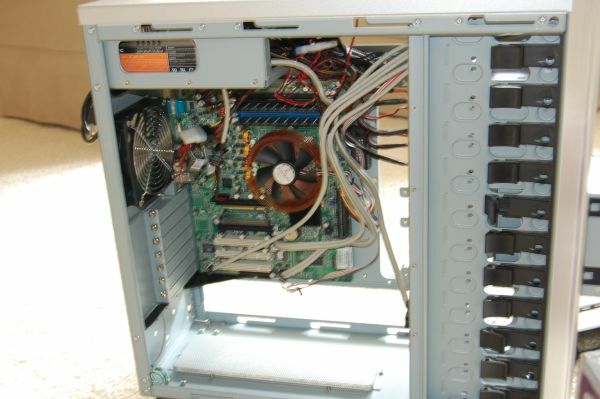 The drives are secured using screws, but there are 2 panels and 4 rails that must be held in place before sliding it into the front of the case. And if you take it out, it completely fall apart. I would prefer these snap together somehow, but I guess I won’t be removing the drives all that often. If you really want to stretch the capacity of the case, you can use three SuperMicro CSE-M35T-1B 5-in-3 hot-swap SATA enclosures and fit 15 hard drives plus two more 5.25″ drives. 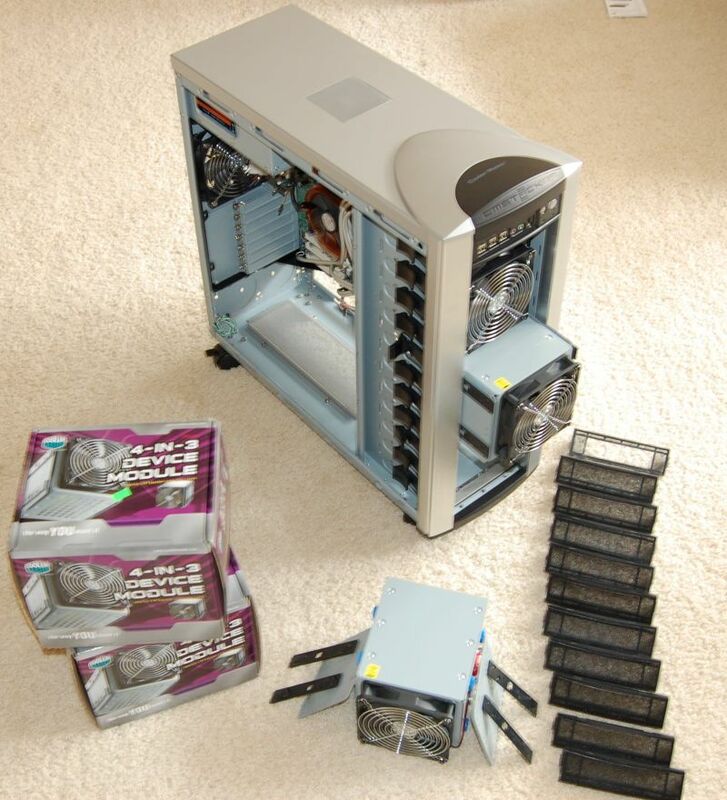 Personally, I think spending more on drive enclosures than you do on a case is a waste of money. I seen no need to hot-swap drives in a home server, but it is an option if you need the space and can tolerate the loud, high-pitched fan of these SuperMicro enclosures. This case is designed for a bunch of airflow. The downside of this is that it creates more noise as compared to my almost-completely-sealed-and-silent Antec P180 case. The perforated covers on front of each of the Stacker 810 drive bays are great for airflow, not so great for sound blocking. Luckily, due to the large 120mm fans and super-quiet Samsung drives, the noise is a soft, background noise rather than a higher-pitched, shrill, annoying noise. But hey, this is a server case, and servers should be hidden away in a back room, and not in your living room or home theater. Cooling trumps noise for a server case, and this one has great cooling. I monitored my hard drive temps, and all were at or below 26-degrees C.
Pros: This is a great case because it is very simple to work with, supports multiple motherboard sizes, has great cooling, and has a large number of drive bays. For the price, it is a very well-made server case. Cons: The disadvantages are that it is not super-quiet and it takes up quite a bit of space (more than it really needs to due to so much unused space inside.) Unfortunately, it does not come with a power supply and it only includes one 4-in-3 hard drive module. I have the exact same case, and I love it also. Sure, the sidepanels feel somewhat “flimsy” compared to the thicker steel construction used in most other cases, but they’re sturdy enough for normal use. The only problem I found with this case is that it’s utterly incompatible with 3.5″ multi card readers. Unlike diskette drives, they don’t have “upper” and “lower” screw holes, and there’s no possible configuration that allows you to install a 3.5″ multi card reader using the provided components in such a way that the location of the reader aligns with the front cover gap. I actually ended up giving two away to my friends for this reason, and will probably be installing a big 5.25″ multi card reader soon. On the other hand, the 6 front USB connectors, front audio and firewire connector located on the power button module are a nice bonus and definitely more than most mainboards support anyway. Also, I don’t seem to have that problem you appear to have with the 4-in-3 module; the sideplate is held in place by the pressure of the rubber vibration dampeners; I can hold the module with the plate facing down and subject to gravity, and it still won’t come loose. Can you please tell me where can I buy that case.